Hello Readers. We are debuting a new and (hopefully) recurring column today called “Get to Know a Uruguayan.” This is where I pick a Uruguayan athlete you may never have heard of, introduce him/her to you, and tell you a little bit about him/her so that you can hopefully become a fan and follow him/her. That sound like fun? It does to me! Today’s guest on Get to Know a Uruguayan is only 16 years old, but he’s already playing professional fútbol. To be honest, a lot of these guys will probably be fútbol players (it’s what we do). The only difference is that this youngster is playing professionally in the United States! Meet Diego Fagundez! Diego is currently a forward and midfielder for the New England Revolution of Major League Soccer (MLS). Like many great men before him (yours truly included), Diego was born in Montevideo, Uruguay. Much like yours truly, his family moved to the United States when he was five years old. While I went on to become an internet sensation (it could happen), Diego turned his talents to fútbol. He had a little help from genetics too, as his father, Washington Fagundez, played professionally as a goalkeeper in Uruguay in the 1990s. 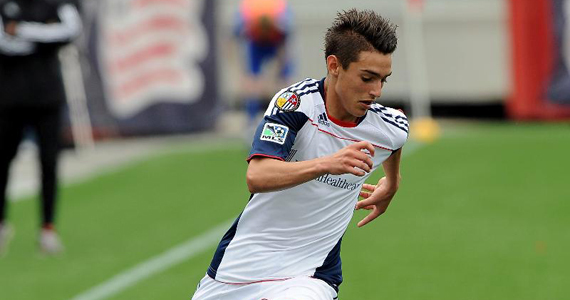 After playing youth fútbol and on some local club teams, Diego was signed to the New England Revolution academy team in 2009, which he promptly led to a first place finish in his first season on the team. His 20 goals in 30 games were good enough to tie him for first place in the league too. He was finally signed to the big boy club last November at age 15, and made his debut during April’s U.S. Open Cup, but he didn’t make his MLS league debut until August 6th against Chivas USA. He came in as a substitute in the 80th minute with the Revolution trailing 2-0. Despite his diminutive size (he’s 5’8″ and 125 lbs) it only took him two minutes to make a very big impact. He drew a penalty, which Sharlie Joseph converted, and the score was 2-1. Chivas USA scored another quick goal before Fagundez delighted the fans with a goal of his own (see the video below). Sure the defense and goalkeeping were a little spotty on the play, but it was still Diego’s first professional goal, and he became one of the youngest player in MLS history to taste the back of the net (the great Freddy Adu was 14 when he scored his first). Overall, it was a wonderful debut for a kid whom I hope will eventually make a big impact in the MLS, and maybe even on the international circuit (for team USA) if he’s good enough. Who knows, we could have the next Tab Ramos on our hands. Wouldn’t that be nice for us all? Here’s Diego’s official New England Revolution profile page.